The Melitta name has stood for passion and quality for over 100 years. 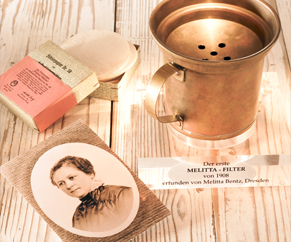 In 1908, Melitta filters and drip coffee were founded by a housewife in Minden, Germany. Melitta Bentz was in search of a better way to make a cleaner cup of coffee. So she punched holes in a brass pot and used a piece of paper to create a two-part filtration system. She put the pot on a cup, filled it with ground coffee and poured in hot water. The coffee filter and drip coffee were born. More than 100 years later, Melitta Bentz’s innovation remains the precursor to all modern pour-over and drip coffee brewing worldwide. Melitta is dedicated to providing the ultimate coffee experience with gourmet coffees, filters and coffeemakers. Melitta Worldwide offers goods and services for coffee pleasure, as well as food storage, food preparation and cleaning in Europe, North and South America and Asia. Melitta Canada was established in 1960, as Melitta’s first overseas subsidiary, and is headquartered in Vaughan, Ontario. Melitta Canada handles the retail sales of Melitta coffee, coffee filters and non-electric coffee preparation products in the Canadian provinces. At Melitta, we are dedicated to offering superior products and we maintain a genuine commitment to exceed customer and industry expectations. We owe our success to our loyal customers and devoted employees, who embody an unyielding passion for the perfect cup of coffee.